It's been more than a year since she lost her family—a tragedy that has left Grace Whitaker a shadow of her former self. Unable to move on surrounded by so many memories, she makes the desperate decision to return to her childhood home in Port Dover, Ontario, Canada. There she hopes to salvage the broken pieces of her life—but what she finds is the promise of peace and healing in an unlikely place. Copper Creek Farm is part of a Canadian historical museum, offering glimpses into nineteenth-century pioneer life. Yet the farm offers much more than that—it is a place of second chances. For Grace, the opportunity to work the land alongside the loving Whelan family is the first step toward healing. But she isn't the only broken soul seeking hope on the farm. Grace is joined by a young man in trouble with the law, as well as the Whelans' son and grandchildren, who are struggling through their own heartbreak. Together, these survivors discover the strength that can be found in friendship. But when faced with the uncertainty of the future, will they have the courage to move beyond the past to forge new lives for themselves? Such a lovely book! Even though it's more women's fiction with just a hint of romance, it was an absolute pleasure to read! (So don't let the lack of romance deter you!) It seems I've been reading quite a few books lately where the characters are dealing with grief, and I was impressed with how much grace and dignity this book had in comparison. Perhaps because the characters aren't so young, perhaps because the time period is several months after the tragedy. There is a beautiful poem that Grace is inspired by as it expresses the devastation of loss, and also the journey into accepting a new life. While Grace is still experiencing deep feelings of grief, she is also striving to take those first steps into beginning again, coming back to life herself. The hard work of the farm and the nurturing of plants is portrayed beautifully yet realistically as it plays a cathartic role in the lives of Grace and others who are struggling. It made me want to throw on a pair of gloves and dig in the dirt of my own garden! I loved how the caring friendships Grace embraces help support her in her new path of recovery. The tender moments brought tears to my eyes, and the hope and faith enriched by the farm and its loving inhabitants made me just feel good while reading. Highly recommend! This story is so gentle and honestly, slow moving. It reminds me of a small creek in the mountains- trickling and meandering it's way down. There is nothing heart pounding or intense about it. It follows one woman and her journey from broken and barely living to healing and light again. 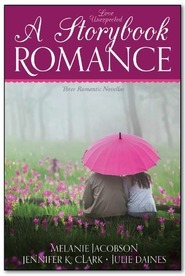 This is not a romance. It's more what I would call LDS women's fiction. Grace has suffered so much heartbreak- honestly, I can't even imagine a scenario such as hers. Grief and devastation have been her constant companion for eighteen months and now she is taking a huge step outward by moving across the country to try something new- some different that will hopefully help piece back together her broken parts. Grace is strong and has so much courage. She is a fantastic character. Her loss has given her a level of empathy and kindness that cannot be replicated any other way. The farm setting was serene and the perfect place for Grace. Hard work and being surrounded by good people gave way to healing for Grace. The pacing is slow and sometimes I found the very detailed explanations of planting or yarn making to be too lengthy for my taste. This wasn't a book that sucked me in from the beginning and held me tight, but it was soothing and calming. Grace's journey is a very satisfying one involving healing and hope. The Song of Copper Creek is a good, albeit slow, story about healing and moving on after tragedy. It was the type of book I could put down and come back a day or so later to pick up where I left off. I thought it was a sweet story. Grace had been through a big loss (although it takes quite awhile to get to the details in the book), and has left her home and everything behind to try to heal for the summer. She ends up at a working farm near Port Dover, Ontario, Canada, where she hopes to learn some new skills in exchange for room and board. She quickly bonds with Laura, Martin, their grandchildren, and their neighbor, Toby. I really liked Toby. His personality was just what Grace needed to start opening up and be a shoulder to cry on when she was ready. Not a lot happens in the story, but a lot happens inside Grace being able to move forward with her life. The story showed the importance of family (even adopted family) in order to move on in life. I don’t see myself reading this again, but I don’t regret reading it. It was clean. I really did not expect to love this one as much as I did. But I fell in love with the characters immediately and read the book in one sitting. Grace is a very sympathetic character as she struggles to find a new life for herself after losing her entire family in the blink of an eye. She comes to Copper Creek Pioneer Village in search of a respite and a chance to learn to breathe again. She finds so much more than that. She finds a new home and a new adopted family. While no one can replace the family she lost, she can't help learning to love the Whelans and their grandchildren. And as she learns to farm, she also learns the value of hard work and the healing that can be found in working in the soil. Surprises come as she once again opens herself up to friends, and to helping the Whelan's grandchildren deal with a loss of their own. I also found the describes of carding of wool and planting remarkably interesting. There were even moments of humor as well in addition to the possibility of a new love interest. But the focus here is on finding healing and Grace stepping forward into a future different than what she had planned. Highly recommended. I can't imagine going through the grief, heartache, and pain that Grace has endured. I don't know if I would be strong enough to recover from losing my world, and although she has her ups and downs, Copper Creek Farm is really the first step towards finally allowing herself to heal. I was taken aback by the gentle, tranquil feeling of this story. I can only compare it to a comfort food or something like Anne of Green Gables (without the precocious red-head). Through farming, simple living, acceptance, and pure love, Grace is finally able to begin to know peace and to extend that feeling to others around her who desperately need it. This rag-tag assembly of characters wrapped themselves around my heart and found myself wishing for a summer exactly like this one, from the setting to the friends. The vivid descriptions and imagery stayed planted in my mind, long after I finished the story. There's not a lot of romance, some hints here and there, but I was still completely captivated and enchanted by this story. Content: mild+ religious elements; extremely mild romance.